Two weeks before CES began, the engineers at Carl Zeiss internal Smart Optics lab were putting the finishing touches on a prototype that will give Google Glass a run for its money. Despite tons of hype, Google’s first attempt at putting technology on your face never went mainstream, because it was incredibly obvious that you were wearing Google Glass (and no one wants to be labeled a “Glasshole”). Zeiss has created an unobtrusive curved smart lens that puts data directly inside the glass, rather than relying on a heads up display to augment reality. I sat down with Kai Stroeder, managing director of Zeiss’s Smart Optics group, to find out how Zeiss’s smart lens works—check out the video above for that conversation—and it boils down to multiple light streams reflecting through a Fresnel lens, so the data you’re looking at isn’t projected on to the lens. The curved part is important: That makes it possible for the lenses to be worn in standard frames, and even come with prescriptions like your average lens. And no one looking at you can tell your glasses delivering data right in front of your eye, which is exactly where Google Glass went wrong. I tried on a pair of prototype glasses and watched a demo reel of apps in the lens. Like Google Glass, information in Zeiss’s prototype lens is only really viewable if you focus on it. Once you do focus your eye, you can read text and see full-color photos with tons of detail. The image quality wasn’t completely clear, so I had a headache shortly after taking the glasses off. Stroeder said Zeiss has already developed a solution for that problem in the second version of its prototype. Zeiss doesn’t make frames or operating systems, just lenses, which means it needs partners to create frames and power them with either an existing OS or a new one. Once the company finds a partner, it’s prepared to mass produce the lenses . 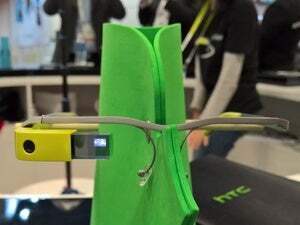 Within a year or two, smart glasses might just become a real thing that people wear and not an unfortunate punchline.